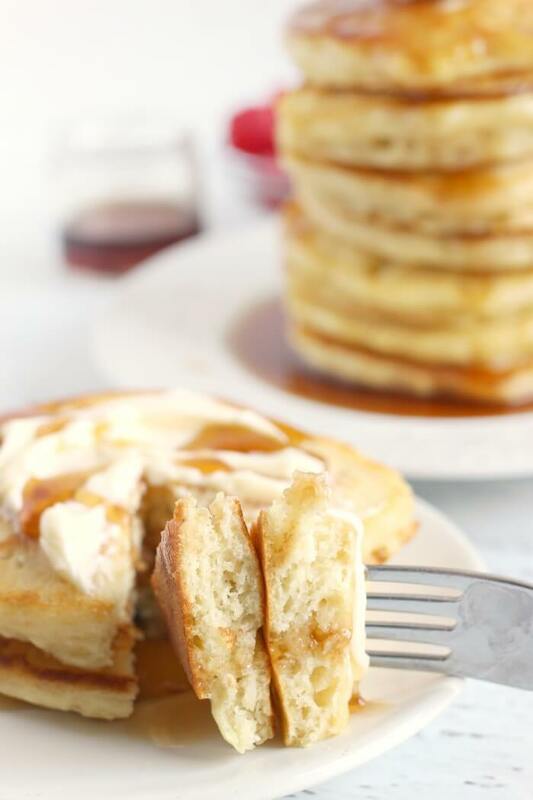 If you’re trying to find a Pancake Recipe to make the BEST fluffy pancakes, look no further! This easy pancake recipe is tried and true! I don’t even want to admit how many hours my daughter and I spent in the kitchen working on this pancake recipe. We were bound and determined to come up with the BEST fluffy pancake recipe possible and after many (many, many) tries – we. nailed. it. 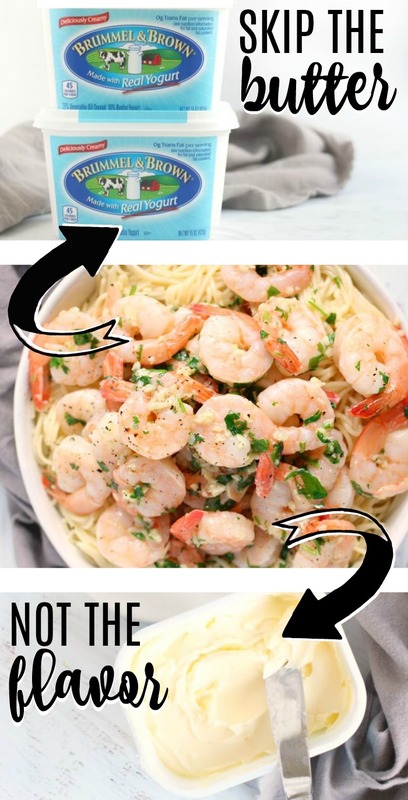 This great recipe is easy and delicious! Make sure to make some bacon in the oven and poached eggs to serve alongside our pancake recipe! Oh, and maybe a peppermint mocha if you feel like treating yourself. All purpose flour – Make sure you don’t purchase self rising flour as it will already contain leavening agents and salt. You can substitute wheat flour if you’d like, but you may need to add additional liquid to the recipe. 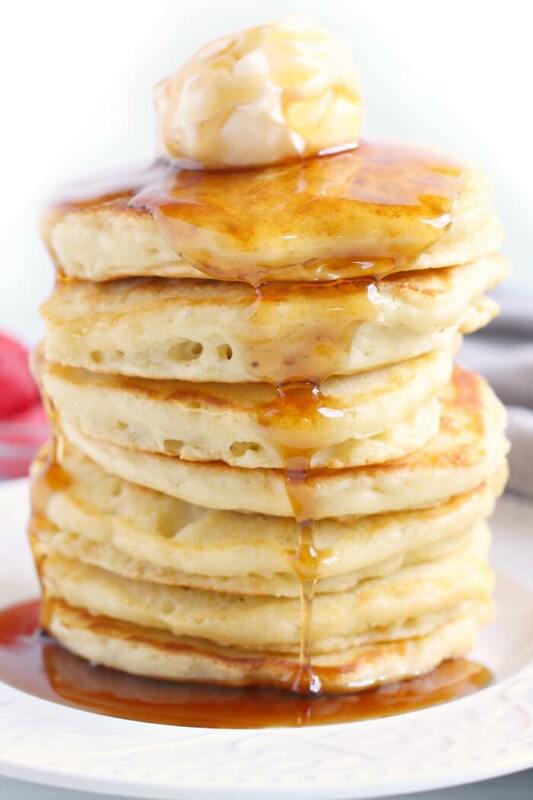 White sugar – Regular granulated sugar here; this can be skipped if you don’t prefer a sweetness to your pancakes or if you need to avoid processed sugar. Baking powder – Baking powder works as a leavening agent to help make these the best fluffy pancakes. 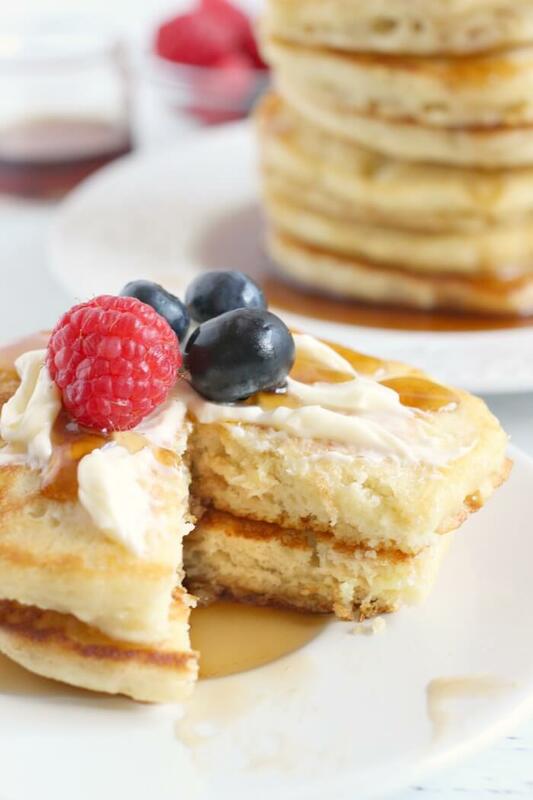 Baking soda – Baking soda also helps make these homemade pancakes super fluffy. Salt – Just a little bit of salt goes a long way to elevate all the flavors in a recipe. 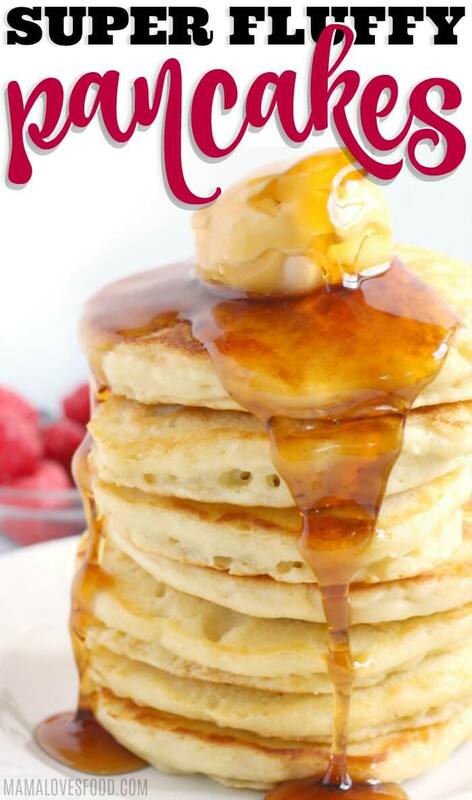 Milk – My preference is whole milk as it gives a richer flavor to the pancakes. 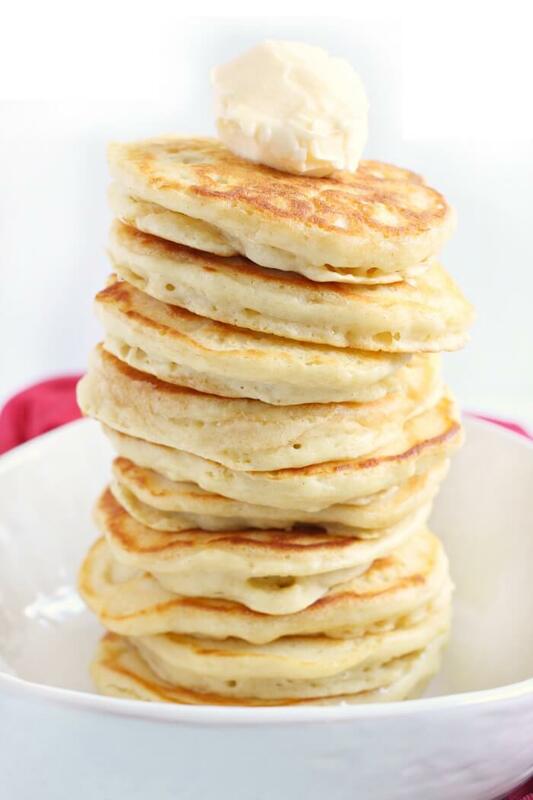 Egg – Speaking of rich flavor, use a large egg to help with both the richness and the fluffiness of these easy pancakes. Oil – I like to use a mild olive oil in our pancake batter, but vegetable oil will work too. First, combine dry ingredients and mix well. Then, in a separate bowl, whisk together wet ingredients. Next, pour wet ingredients into dry ingredients and mix together just until a batter forms. Finally, pour batter onto a greased skillet at medium high heat and cook until bubbles start to form and underside is golden brown. Flip and continue to cook until other side is also lightly browned. You can make this pancake recipe with whole wheat flour, just substitute the all purpose flour for whole wheat. You may need to add additional liquid as whole wheat flour tends toward a little bit drier than all purpose. Add liquid in one tablespoon increments until you reach your desired consistency. This recipe calls for a thick batter. You can make this pancake recipe with buttermilk if you prefer buttermilk pancakes. Just substitute the milk for buttermilk. If you do not have buttermilk, but still want a buttermilk flavor, substitute one tablespoon of your milk with vinegar or lemon juice. Combine the milk + acid and let it sit for several minutes before combining it with your wet ingredients. Your pancake batter should look a little bit lumpy and thick – just barely pourable. Make sure not to overmix your pancake batter as that will cause it to be dense and less fluffy when it cooks. If your batter is too thick to pour, add more milk one tablespoon at a time. Pancake batter should not look runny. 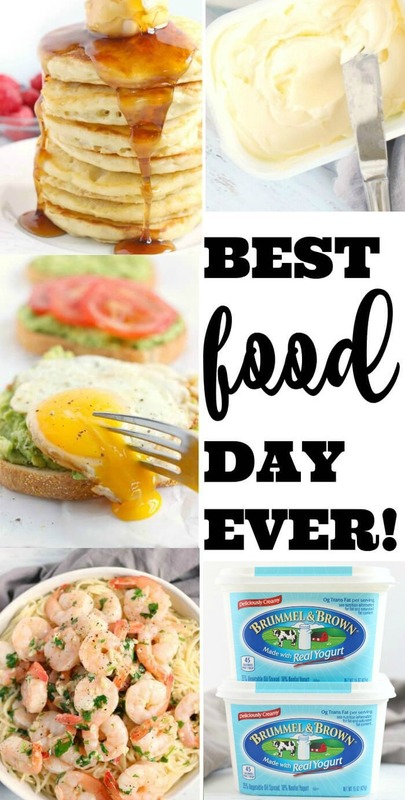 We grabbed our Brummel and Brown at Walmart along with all the ingredients for our pancake recipe, our avocado toast, and our shrimp scampi! If you don’t have time to cruise the aisles, place an order through Walmart Online Grocery Pickup! 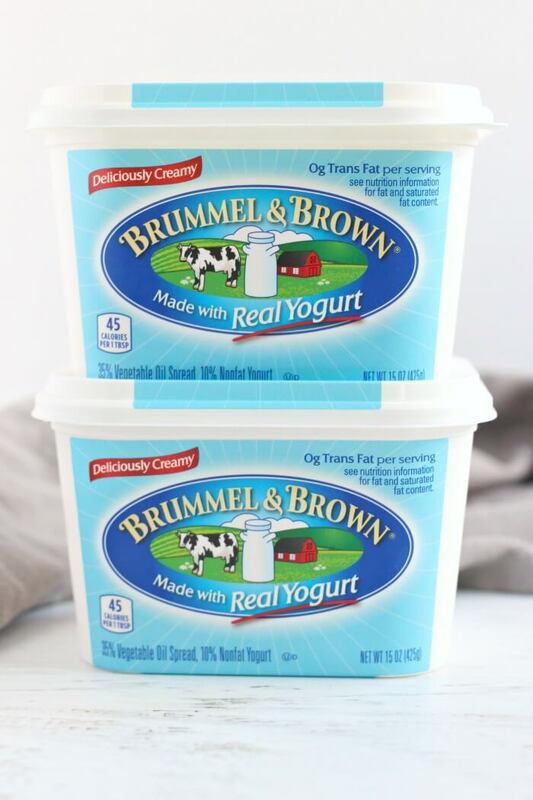 Right now, you can get $1 off ONE (1) Brummel and Brown Original 15 oz. Spread via the Ibotta app! You make pancakes fluffy by using leavening agents like baking powder, baking soda, and eggs. 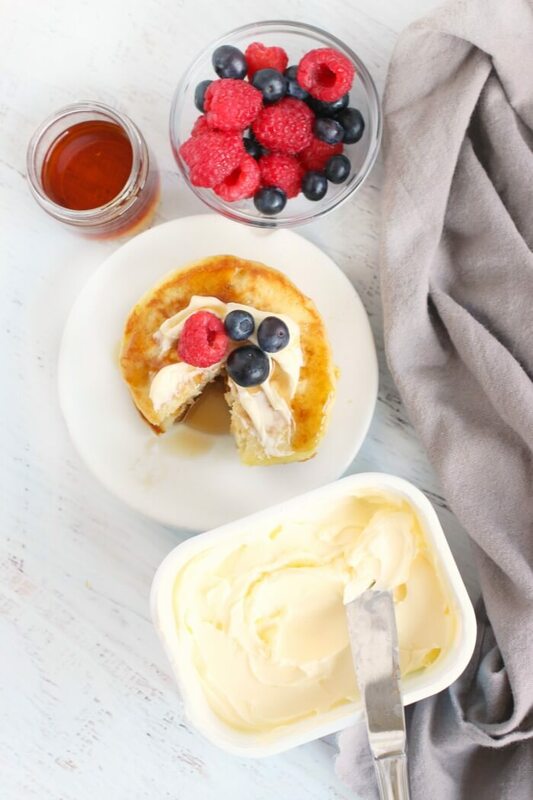 We use a combination of all three in our pancake recipe to make them super fluffy and delicious. It is also important to only gently mix the pancake batter and to cook them on a medium/high heat skillet or griddle. We find that between 325 and 350F is the sweet spot for making perfect fluffy pancakes. Pancake mix is made of flour, baking soda, baking powder, sugar, and salt. Sometimes pancake mix will also include dried milk and dried eggs. You can make this pancake recipe into a pancake mix. Pre-measure the dry ingredients and put them in a mason jar or sandwich bag. Make sure to write the liquid ingredients on the outside of the container so you know exactly what to add when you’re ready to prepare the pancake mix. Store in a cool dry place. Thickening pancake batter in a pancake recipe is a little tricky as it will throw off your ratios a little bit and you may end up with denser pancakes. However it’s better to have slightly imperfect pancakes than to toss an entire batch of batter away! To thicken pancake batter, add all purpose flour to the batter in 1 tablespoon increments, stirring gently to incorporate. There are two schools of thought on whether you should rest your pancake batter. 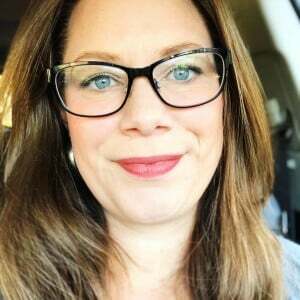 I do not rest my pancake batter, as I have five hungry children to feed in the morning – also, I find that resting your pancake batter often makes the batter thicken too much and can give a rubbery result. 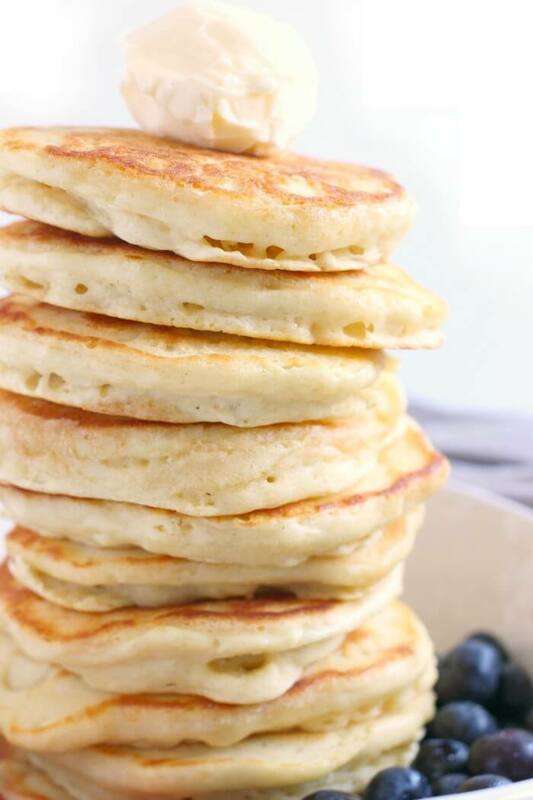 The second school of though is that giving your pancake batter time to rest allows the gluten to develop and can result in a more tender pancake. If you intend on letting your batter rest, add up to a quarter cup additional liquid before resting it in the refrigerator for at least 30 minutes. To make pancakes on the stove, prepare your pancake batter, then place a heavy skillet over medium high heat. If your stove provides temperature readings, we find between 325F and 350F to be the sweet spot. Grease your skillet, then pour about 1/4th cup of pancake batter into the skillet. Allow to cook until bubbles begin to surface, and the underside is golden brown. Flip and continue until pancakes cook to the point where it has fluffed up and reverse side is also browned. To not burn your homemade pancakes recipe, make sure you’re cooking on a medium high heat. If your greasing agent browns quickly, this is a good indication that the heat is too high and you should turn it down before pouring the pancake batter. Do not leave the pancakes on the heat too long and try to use a heavy skillet or a griddle that cooks evenly to not burn your pancakes. Use a thin spatula with a tapered edge. Make sure it’s plastic if you’re using a non-stick cooking surface. Pancake batter can sit overnight in the refrigerator. If the pancake batter sits overnight it will likely thicken – you can thin your pancake batter with additional milk or water. You may want to add a small amount more of baking soda as well to ensure you still get a light and fluffy pancake recipe. Pancake batter will last up to two days in the refrigerator. Make sure it is kept in a sealed jug, bag, or pitcher for best results. You can also freeze pancake batter for up to a month. You can freeze leftover pancakes. Allow them to cool, then store in an airtight container for up to three months in an upright freezer or up to six months in a chest freezer. If you freeze them for longer the flavor and texture of the pancake recipe will diminish. For best results, reheat pancakes in a microwave with a damp paper towel over top. If the pancakes were frozen, reheat in 30 second increments rotating and flipping in-between until desired temperature is reached. You can also reheat pancakes in a toaster oven or standard oven. Large Griddle – Get one with a heavy cast aluminum base with premium nonstick surface assures stick-free cooking and easy cleaning! We use ours for everything from pancakes, to eggs, to chicken breast, and seared steak! There are still two more delicious meals after you’ve gobbled up our pancake recipe! I’d love to suggest that you pull out that Brummel and Brown for some more tasty fun. Keep reading for our lunch and dinner suggestions – we grabbed everything we needed to make this full day of yummy food from Walmart! 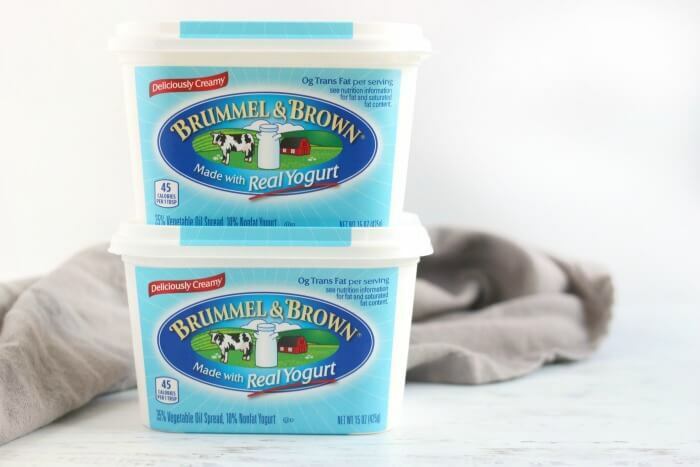 Brummel and Brown is the perfect addition to any meal! And right now you can get $1 off ONE (1) Brummel and Brown Original 15 oz. Spread via the Ibotta app! One of my absolute favorite easy lunches – and here’s my super-secret for taking your avocado toast up a notch. Add a smear of Brummel and Brown to the toast before your mashed avocado for some extra buttery goodness. And if you’re feeling super inspired (I know I am! 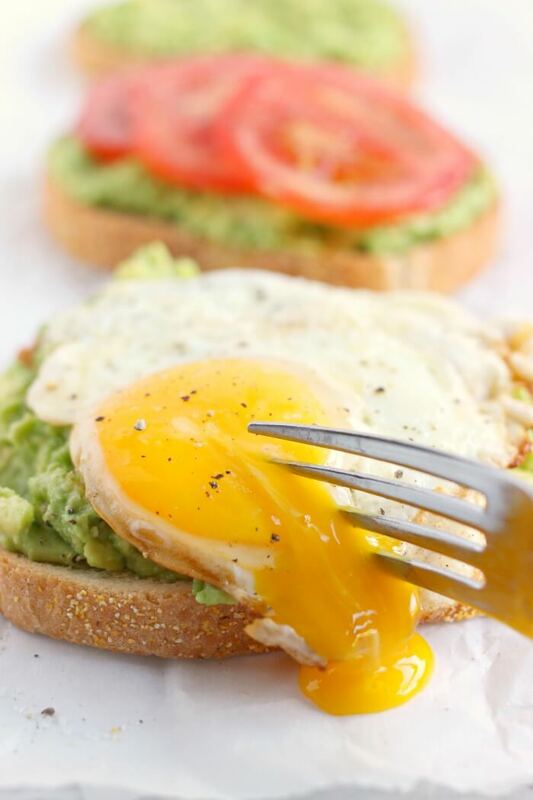 ), fry a gorgeous sunny side up egg in a pat of Brummel and Brown then add it to your avocado toast with a generous sprinkle of salt and pepper. If ever there was a way to make dinner quickly, easily, and a 100% crowd pleaser, it’s with a skillet of shrimp scampi over angel hair pasta. 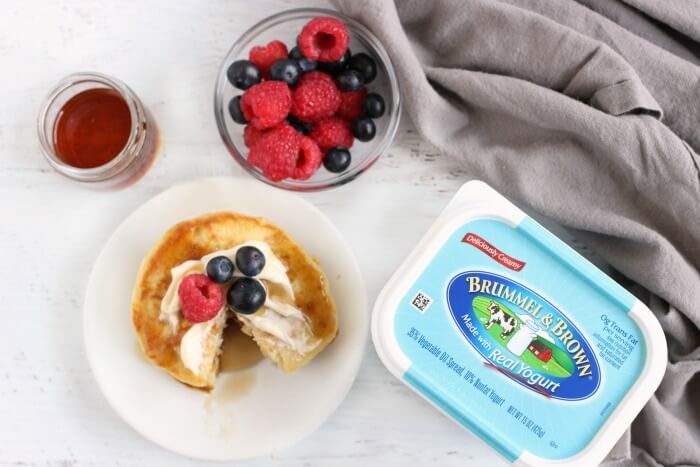 Make sure to swap out the butter for Brummel and Brown when you make yours to capitalize on all the flavor PLUS the nutritional value of organic yogurt and plant based goodness. If you're trying to find a Pancake Recipe to make the BEST fluffy pancakes, look no further! 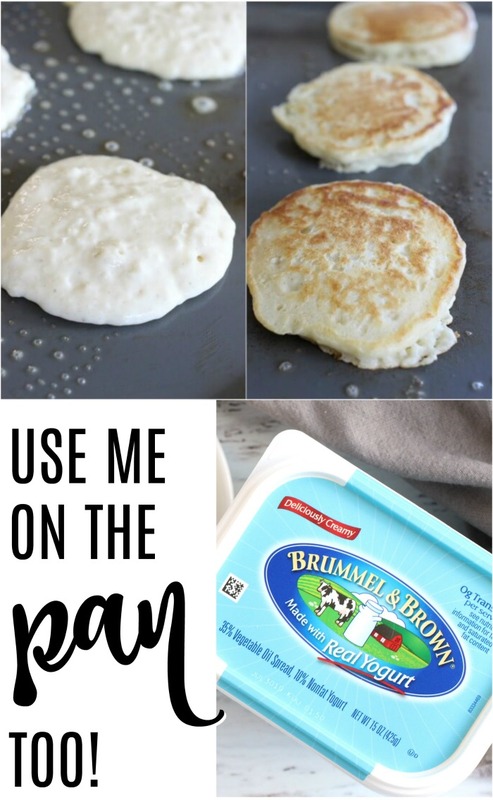 This easy pancake recipe is tried and true! In a large mixing bowl combine dry ingredients and mix well. In a separate bow, whisk together wet ingredients (excluding Brummel and Brown). 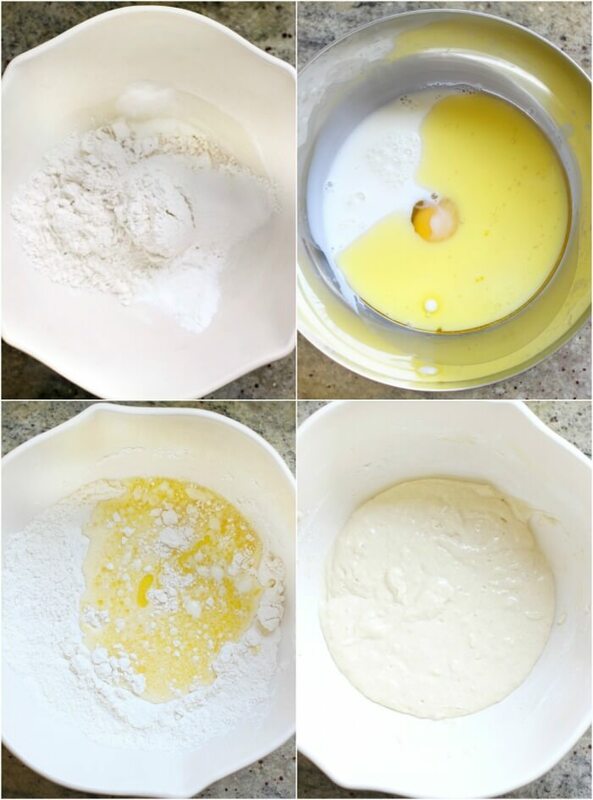 Pour wet ingredients into dry ingredients and mix together just until a batter forms. Make sure to scrape the sides with a spatula to incorporate all the dry ingredients. Do not overmix - it is okay if the batter is lumpy. This is a thick batter, it should be just pourable. If you find the batter is too thick, add additional milk in 1 tablespoon increments. Use a small ladle or measuring cup to pour batter onto a greased skillet at medium high heat (I find 325 - 350F is best). Use the back of the ladle to get pancakes into the size and shape you want, if necessary. Cook until bubbles start to form and underside is browned. Flip and continue to cook until finished. Top with Brummel and Brown, fresh fruit, and maple syrup. Makes approximately 12 pancakes when using ¼ cup ladle. « Lemon Mousse- Only Three Ingredients! Seriously love these!! Fluffy pancakes are the best pancakes! So fluffy and fantastic! 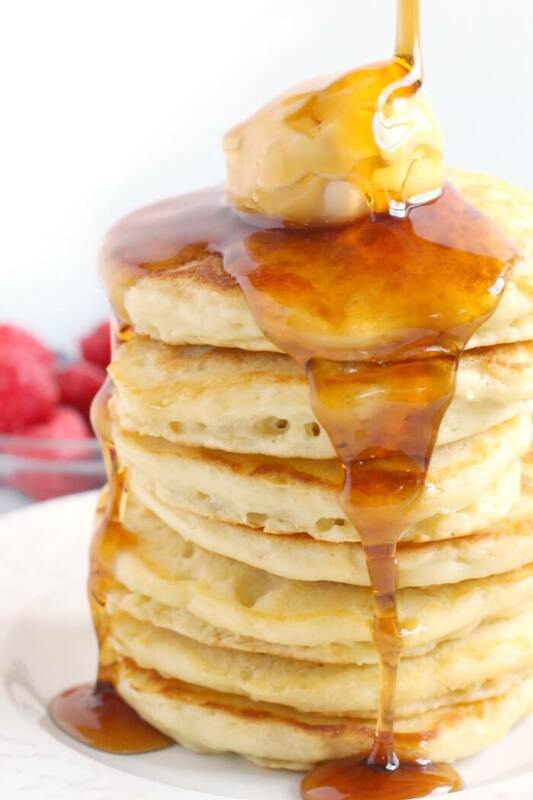 I could seriously eat these pancakes all weekend long, every single weekend! Too much stuff before you finally get to the recipe. But they ARE really great! !